The Greyrock Mountain summit must be the most rewarding summit in the vicinity of Fort Collins, Colorado. It not only offers views of the snow-capped Rocky Mountains and the big sky above the Great Plains, but also the wonderful treat of two small mountain lakes. 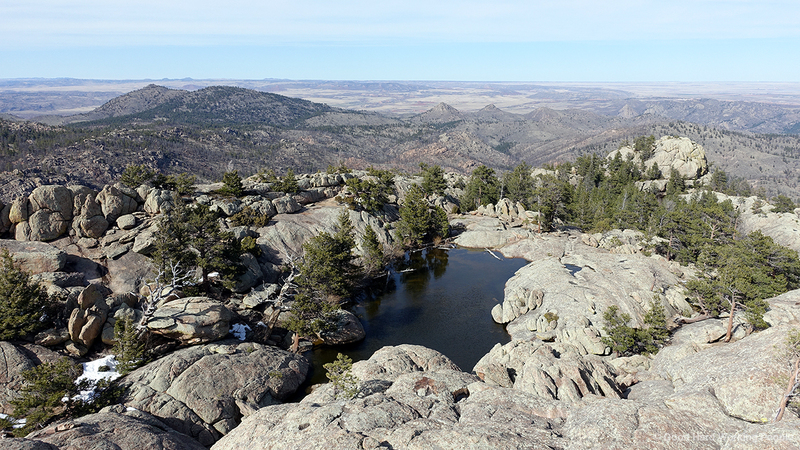 To enjoy the rewards of the 7,600 feet Greyrock summit in the Laramie Mountains range, you have to work for it: a hike covering 2,040 feet of elevation. The Roosevelt National Forest trail starts right off Colorado Highway 14 (aka Poudre Canyon Road). After about 0.75 miles you have to choose between two trails: the mellower Greyrock Meadows Trail (2.6 miles) and the more recommended Greyrock Summit Trail (1.7 miles). I covered that first part of the hike in the video "Greyrock Summit Trail (Part 1) – In A Colorado Minute (Week 272)." Once you've passed the first lake, there are a few small signs with stylized hikers but without arrows indicating the correct direction. My new insider information: walk to the left of the signs, and you may just see another sign higher up in the rocks to aim for. Also helpful are the cairns (piles of rocks) that previous hikers have left to indicate the right direction to the very top. You get to the second small lake, and then if you're ambitious (and come on, you made it this far), you can climb even higher to look down at the lake, the surrounding towns (Laporte, Fort Collins, Bellevue), other hills and Lake Watson and Horsetooth Reservoir. In the other direction you get your classic view of the high snow-covered peaks of the Rocky Mountains. If you want to do this hike, I recommend getting there early because parking is limited. Bring plenty of food and water. While there is a stream along the trail and then the lakes up top, the water is supposedly not save to drink even for dogs because of the possible presence of Giardia bacteria. When my friend, artist and yoga instructor Lisa Eaton and I went up there this week, it took us just under 3 hours (with a long lunch break) to get up and about 1 1/2 hours to get back down. Lisa will be leading a yoga retreat up to the summit later this month. Be in touch if you're interested, and I'll connect you. I highly recommend this hike! The song in the video is “Folk Bed” by Jason Shaw of Audionautix. He has made this and many great tunes available via a CC BY 3.0 license. Thank you so much, Jason! Travel more with Moving Postcard!